The last couple of days have seen potential details leak online for what looks to be the Netflix Black Mirror: Bandersnatch interactive movie. 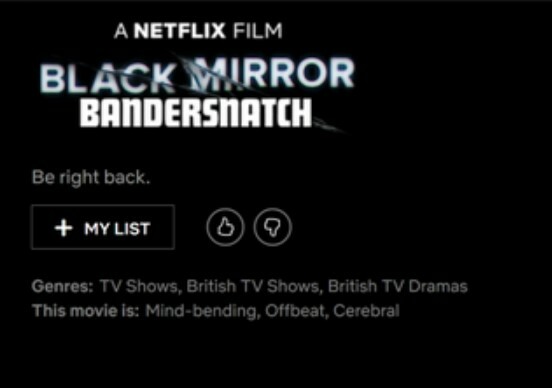 Fans first spotted a title placeholder page for Black Mirror: Bandersnatch on Netflix where it is listed as "A Netflix Film" and 90 minutes in length. Further information was found on a Korean Media Rating Board, which suggests Black Mirror: Bandersnatch is an interactive movie as the runtime is listed at 312 minutes, or 5 hours and 12 minutes long. Obviously, the movie wouldn't be five hours, but if it is an interactive choose-your-own-adventure film, the 90-minute runtime seems to fit, with the various choices making up the 5-hour length. The Korean Media Rating Board also features a synopsis that hints at the interactive possibility as well, which offers (translated via Reddit): "A young programmer makes a fantasy novel into a game. Soon, reality and virtual world are mixed and start to create confusion." The movie is also described as having "extremely strong violence." Back in April saw filming take place in London for what was thought to be a "Bandersnatch" episode, but now it appears to be for the interactive movie. Set pics seemed to offer the film will take place in the 1980s in London. 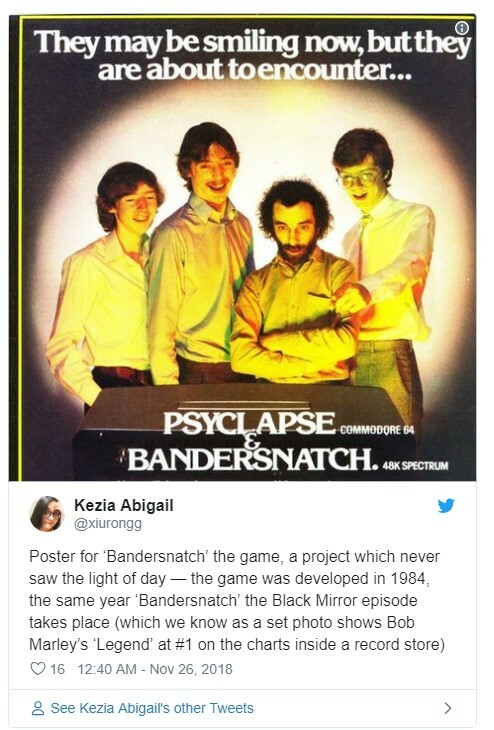 Users on social media have pointed out that a "Bandersnatch" game was actually being developed back in 1984, but never saw the light of day. It looks as if the episode takes place in that year as well. "Bandersnatch" is also a reference to the fictional character from Lewis Carroll's Through the Looking-Glass novel about Alice in Wonderland and again featured in his poem The Hunting of the Snark where the Bandersnatch grabs a banker. The character is described as having a long neck and snapping jaws, and both works describe it as ferocious and extraordinarily fast. We can guess "Bandersnatch" is a metaphor being used in the Black Mirror Netflix film. Details also having leaked include that David Slade, who directed a previous episode ("Metalhead"), is the director Bandersnatch, and that the cast includes Fionn Whithead, Will Poulter and possibly Asim Chaudhry and Craig Parkinson. Netflix first announced plans for an interactive choose-your-own-adventure Black Series episode back in October, and they have seemingly confirmed the interactive movie as they offered a response to The Verge website teasing, "Thanks for reaching out! You have the ability to choose your own response from Netflix: this or that." Black Mirror: Bandersnatch also has a potential release date of December 28, 2018.